Iranians celebrate nuke deal, but the party may be short-lived. 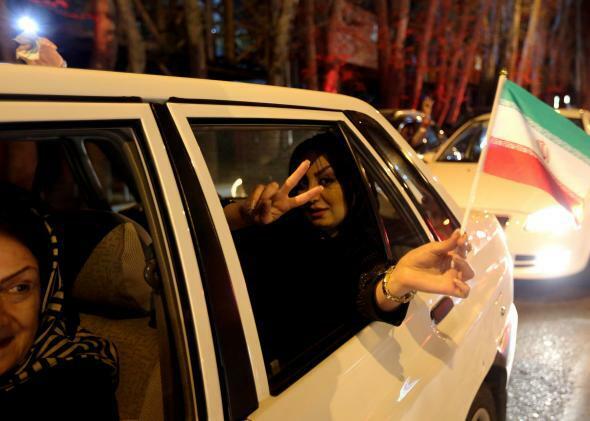 A woman in a car flashes the “V for Victory” sign and waves an Iranian flag as people celebrate on Valiasr street in northern Tehran on April 2, 2015. The Iranian leader whose opinion matters most of all, Ayatollah Ali Khamenei, has not yet made a statement. But at Friday prayers, conservative cleric Ayatollah Mohammad Emami-Kashani said that the supreme leader backed the deal and praised the negotiating team. The reaction to the deal reflects the country’s political divide. The crowd celebrating the agreement reportedly chanted “Kayhan, Israel, our condolences.” Kayhan is a hard-line conservative newspaper that has staunchly opposed Zarif’s concessions. Its editor wasn’t won over Friday, saying of the negotiating team, “We gave them a saddled horse and they gave back some broken reins.” Some members of the country’s parliament echoed their counterparts on Capitol Hill, demanding the right to review the agreement. They pledged not to support any deal that did not lead to a complete lifting of sanctions. It’s becoming clear that the timing and extent of sanctions relief is going to be the main sticking point during the final phase of negotiations this spring and summer. The joint statement out of Lausanne Thursday was vague on this point, saying that the U.S. and European Union would terminate their nuclear-related sanctions on Iran “simultaneously with the IAEA-verified implementation by Iran of its key nuclear commitments.” A U.S. State Department fact sheet released Thursday clarified that this means sanctions would only be lifted “after the IAEA has verified that Iran has taken all of its key nuclear-related steps.” This makes it sound as if sanctions will be lifted gradually as implementation is verified. In a series of grumbling tweets Thursday, Zarif dismissed the State Department fact sheet as “spin,” implying that sanctions would be lifted immediately upon the deal going into effect. A full and immediate end to sanctions is almost certainly not something the Congress will authorize. So that’s a big issue that will have to get worked out between now and June 30, which is still a long way away. Update, April 3, 2015: In a televised address on Friday, Rouhani said that Iran would abide by the terms of the deal but that if the other countries involved “want to take another path, then the Iranian nation will also have other options.” He also said the deal shows that the world had affirmed Iran’s right to enrich uranium.